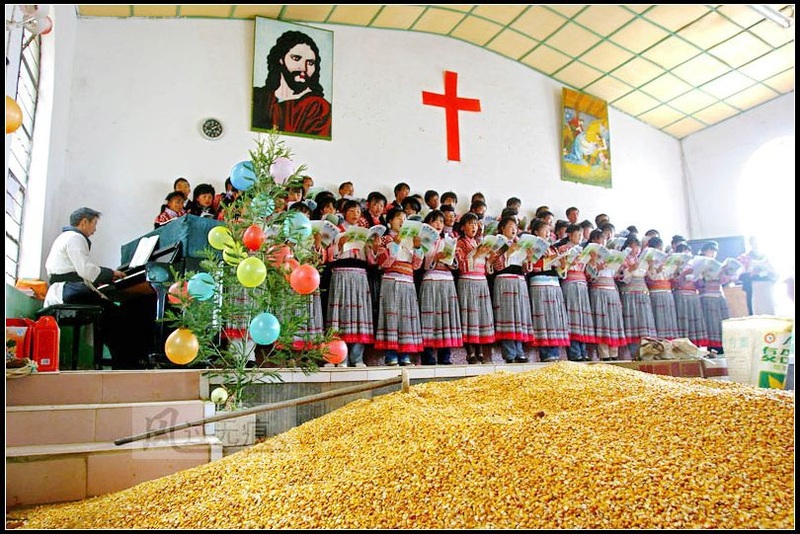 A farmers’ choir from the small town of Little Well, in the Yunnan province of China, attracted everyone’s attention at the China Central Television’s Young Choirs Competition in 2008. The chorus is fully comprised of Miao farmers. They wear highly traditional clothes that they made themselves and look so relaxed and natural that you can almost smell the fragrance of the earth coming from their sun-burnt faces. Surprisingly, the choir did not sing local folk songs but chose instead ‘For Unto Us a Child is Born’ from Handel’s Messiah. Their voices were very harmonious, but it seemed to our ears somehow strange that their sound was a mixture of bel canto and Miao style. Their sopranos and altos were very bright but they did not sound sharp at all. Their tenors and basses were deep and dignified. All in all, the chorus combined the fresh Miao style with the sacred church music one perfectly, but generated this rather peculiar effect. They performed however like musicians with full formal music training and at this particular competition were required to sing a piece without the score –they did an excellent job. 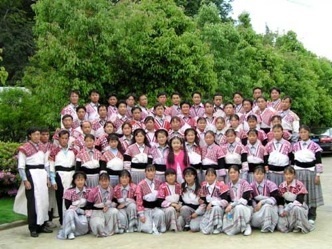 During the Expo 2008 International Folk Music Week, the Yunnan Little Well Miao Farmers’ Choir came to the National Theatre again to perform and their excellent performance was warmly received by the audience. 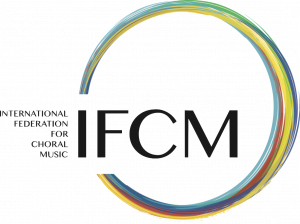 On 8th October 2008, a Solfeggio Teaching Forum was held at the Chinese Central Conservatory of Music, which is the highest music institution in China. 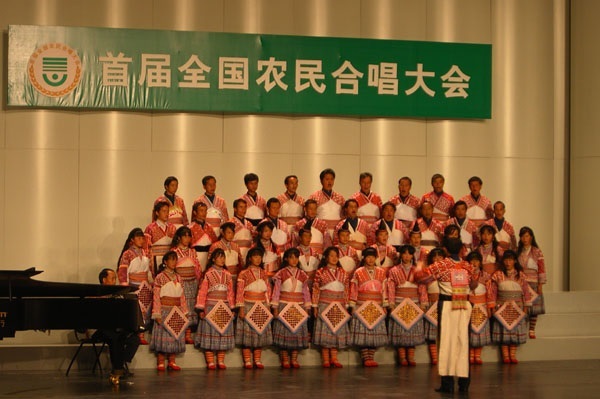 The organizing committee invited the Yunnan Little Well Miao Farmers’ Choir to perform a concert at the forum and the audience were treated to selections from the Messiah, such as, ‘Worthy is the Lamb’, ’And the Glory of the Lord’, ‘The Lord Gave the Word’, and ‘Hallelujah’, as well as a setting of the Gloria by Mozart. They also sang ‘Zigeunerliedchen’ from Liederalbum für die Jugend Op.79, No. 7 (1849) by Robert Schumann and the Scottish folk song Auld Lang Syne. A total of sixteen works were given at this special event and the audience were impressed with the choir’s ability to perform music from the Baroque and the Romantic periods equally well. We could not help ourselves wondering how singers from such remote rural areas, who never received professional music training and are not highly educated, could perform Western choral music so professionally. How could they sing with such wonderful bel canto voices? Why was their ability to read solfeggio so high? Why did they not sing local folk songs instead of Western choral music? Where did they learn this Western music? And who taught them? With a sense of wonder and doubt we went to Small Well, the biggest Miao Village in Kunming, Yunnan. Small Well is located in Fumin County in the southeast section of Kunming City and lies in the mountains at an altitude of 2380 m. A rugged mountain road is the village’s only connection to the outside world. There are 475 villagers living there, 85% of whom are Christian. Because they have over a century of history in Christian beliefs, the village is very a harmonious and peaceful place, and the villagers always try to uphold honesty, trust, and simple charity. In this remote hill village far away from the prosperous world, the villagers are poor in wealth but rich in spirit. The heavy physical labour and rugged village life do not make them unhappy, but instead encourage them to love singing and to love life. The members of the Yunnan Small Well Miao Farmers’ Choir are just ordinary villagers but differ from those of other villages. Everyone in this village loves to sing. Although they have never studied it in school, their level of solfeggio skills and musical abilities are as high as any professional musician. Singing Western choral music has become a custom of the villagers here. So how did all of this come about? In the early 20th century, Mr. Samuel Pollard (1864–1915), a British missionary, came to this area of China. 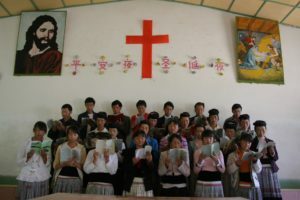 He devoted twenty years to preaching and improving the cultural level of the local people and made many remarkable contributions before he passed away in northwestern China in the city of Guizhou. Meanwhile, Mr. Arthur G. Nicholls, an Australian missionary, also arrived in the area. He taught the local Miao villagers the bel canto style. Once each singer had learned an appropriate voice part, and from then on, the soprano, alto, tenor and bass parts were taught to their children and their children’s children, from generation to generation. They simply taught their children the music and the words and this custom never stopped. 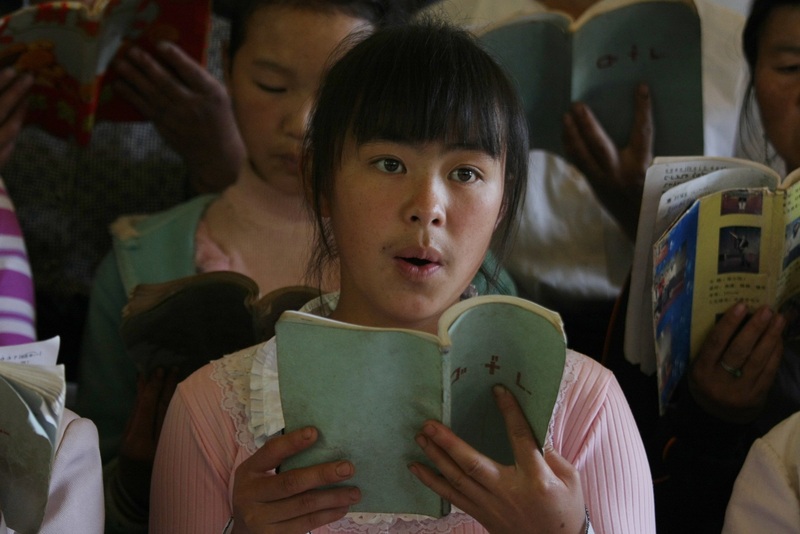 The villagers often sing Christian hymns which were sung by their grandparents but sing secular songs too. 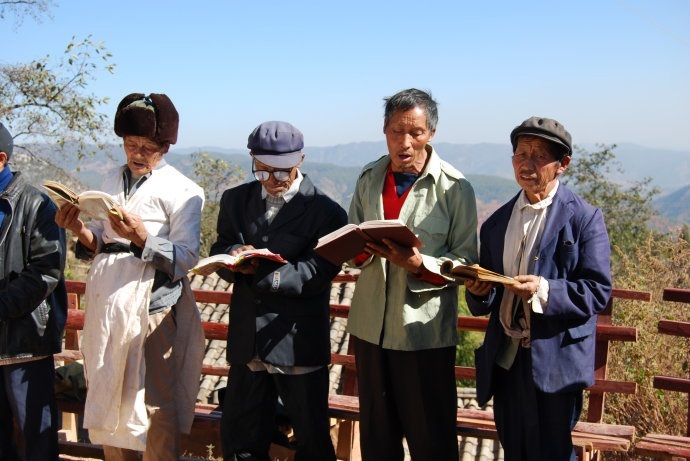 After they finish their physical work for the day they often sing together at night and singing Christian hymns remains their main cultural activity. Everyone in the village can sing although there is no professional conductor and no professional vocal teacher in the village. Most of the members of the village only have a primary school education, but singing is an integral part of life which accompanies them throughout their whole life. In recent years, the choir often has had the opportunity to perform outside the village, but when they return home they are still ordinary peasants who still carry a hoe to work in the field. Because the chorus doesn’t understand the musical symbols, the singers use ‘moveable do’ solfege, and use the ancient Miao letters to name the notes, making the music easier to learn for the young villagers when they join the choir. The choir has over 400 songs in its repertoire, many works in foreign languages, and is familiar with the music of Beethoven, Schumann, Bach, Wagner, Mozart and many other famous composers. They are also familiar with the works of the Baroque period, the Classical period and Romantic period. Considering their relative isolation from the Western world, this is a truly amazing phenomenon. This Miao man in the picture above is of short stature, and who is answering the interviewer’s questions, is the conductor of the choir. His name is Long Guang Yuan and hee had just finished conducting the chorus at the National Grand Theatre before coming back to the village. He was telling us how busy he was with the corn harvest in the fields – the food for the coming year. This can not be delayed. Long Guang Yuan first learned singing from the old men in the village when he was eighteen years old before becoming conductor of the choir for ten years. He is an ordinary peasant and works in the field every day, but rehearses the chorus every Monday, Wednesday, Friday and Sunday evening after work. This is the youngest member of the choir. Her hair is tied in a simple ponytail and she is wearing homespun clothes and she looks like an ordinary girl from an ordinary village, but she has bright and clear eyes. There are four cows at home that she and her younger sister need to care for. She studied at school for five years but then had to leave in order to stay home and support her family. She thinks that this is the fate of every villager. 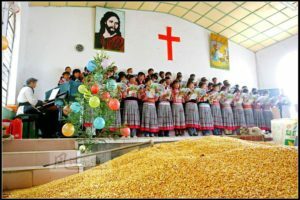 The villagers say that as Christians, they have their children participate in choir from a very young age, and all of them love to sing. When she sang a song for us, this small unremarkable child suddenly changed into a beautiful girl. Her voice was so beautiful, it seemed like we were listening to a song sung in a music hall. It touched our hearts and warmed us with her passion for singing. This is the story of China’s Yunnan Little Well Miao Farmers’ Choir, a very special ensemble indeed. Although they are very famous in China today, they retain their simple life, and this art form still exists in its original state. They pick up a hoe to work the fields, put down the hoe to sing. They are so plain but their songs are so harmonious. With their dreams of this life, their gratitude to heaven and to the earth, their beautiful songs certainly come from deep in the heart as they talk to God in such pure voices. They sing these amazing pieces of music year after year, from generation to generation, and only get better over time.